If you have seen the Story of Stuff video, then you’re aware that after World War II, President Eisenhower’s Council of Economic Advisors came up with the sinister concept of ‘planned obsolescence’ (products designed for the dump). This is, of course, the antithesis of sustainable design. But along the continuum between products intentionally designed with an expiration date, and long-lasting items made from renewable materials, where would one fit objet d‘art? I thought of this question when I came across Maarten Baas‘ Child’s Chair from his Clay Furniture series. 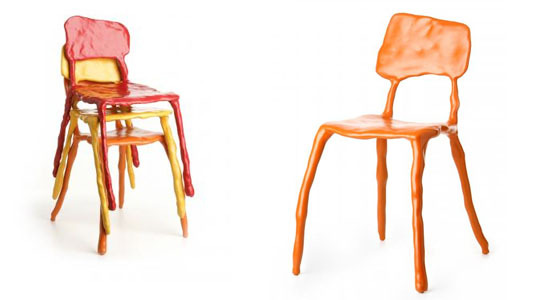 The chairs, which resemble childish models rendered in Play-Doh, are actually made of “synthetic clay” molded over a metal frame. They completely go against the idea of perishability. Plus, scientists believe that synthetic clay may actually help rid the environment of radioactive waste. When this is added to the fact that “all pieces are modeled by hand… making each piece unique,” the Maarten Baas chairs seem at least sustainable by definition, but perhaps not so sustainable when up against the more modern, colloquial meaning. Yet at $2,100 for each chair (available at the Moss website), does any of this even matter? If you have seen the Story of Stuff video, then you're aware that after World War II, President Eisenhower�s Council of Economic Advisors came up with the sinister concept of �planned obsolescence� (products designed for the dump). This is, of course, the antithesis of sustainable design. But along the continuum between products intentionally designed with an expiration date, and long-lasting items made from renewable materials, where would one fit objet d�art? I thought of this question when I came across Maarten Baas' Child's Chair from his Clay Furniture series.